Metex supports the industry’s widest choice of architecture options, which provides our clients the flexibility to implement a Java or .NET architecture that meets their corporate IT standards and user preferences. The first step in a Metex application modernization is to confirm the client’s required architecture standards and options. The optimal architecture for the modernized application may be independently specified by the client or determined with assistance and consultation from Metex. Using client input and information collected through application analysis, Metex produces a detailed architecture design document that will form the roadmap for the modernization project. Metex has developed a comprehensive suite of specially designed automated tools that minimize the time required to complete an application modernization without restricting the choice of Java or .NET architecture options. Each Metex modernization project uses a number of automated tools to transform the original 4GL language code into Java or .NET based on the specific architecture the client has selected. This automation process is defined only after the target architecture is selected to ensure that our process is customized to our clients' architecture (and not the other way around). Metex has also developed different tools to transform the data access, business logic and user interface layers to provide a truly modern 3-Tier solution. A sampling of the Solution Options is listed here, to learn more contact us at salesteam@metex.com. Metex has developed the most advanced suite of application modernization technologies in the legacy modernization business. Metex has aggressively developed its tools over the previous 10 years to provide continuous improvements in its modernization process and remain current with Java and .NET standards. 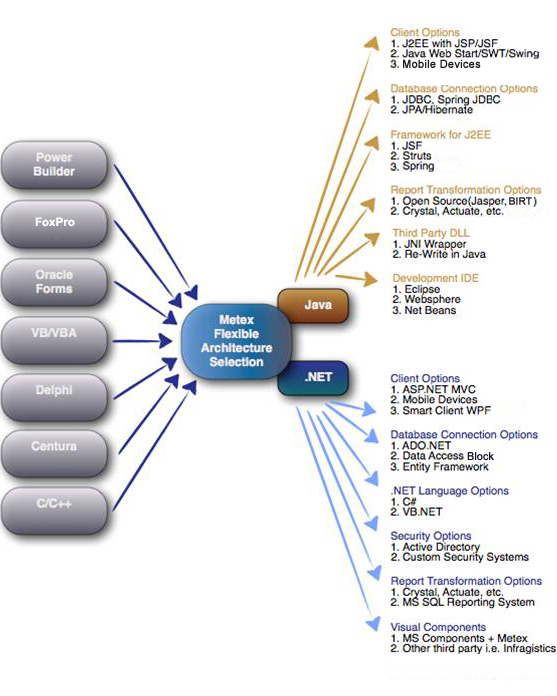 Metex clients specify their desired Java or .NET architectures before any Metex tools are applied. You make the choice; we provide the tools based on your specific requirements.